Removes stains, soap deposits and grease/oil/fatty residues. An effective sanitiser against bacteria. Rapid action efficient cleaner for non porous surfaces. Ready to use – no solutions to make up. No waste, economical in use. Pleasant fragrance, freshens as it cleans. 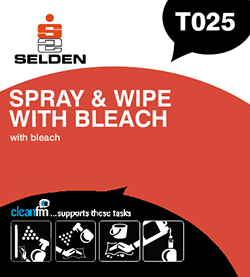 Easy to use – simply spray on and wipe off with a clean cloth or paper towel. For the removal of stains, grease, and soap scum etc. from sinks and basins, worktops and bathroom tiles. Also a highly effective sanitiser against bacteria. Composition A blend of water, nonionic and anionic surfactants, buffer and perfume.